Putting up the Christmas lights is guaranteed to cause havoc whenever it’s time to decorate the tree, and it was no different at award winning Hoo Farm during the opening night. Visitors started the evening with a mince pie and glass of mulled wine, while enjoying some live Christmas music, performed by Kathryn Dean-Netscher on her saxophone. Telford was treated to enthusiastic carolling, baaing and booing (of King Herod!) as the audience were encouraged to participate in telling the story of the nativity. Whisper the Donkey redeemed himself with a sterling performance, carrying Mary and Joseph – played by local children Aimee Gough (6) and David Harris (11) – to the inn. In the spirit of the season, Will spread some Christmas cheer through his joyful (and triumphant) speech, thanking everyone for coming and telling guests about the exciting developments coming to Hoo Farm in their 25th anniversary year 2016 – watch the website for more information. 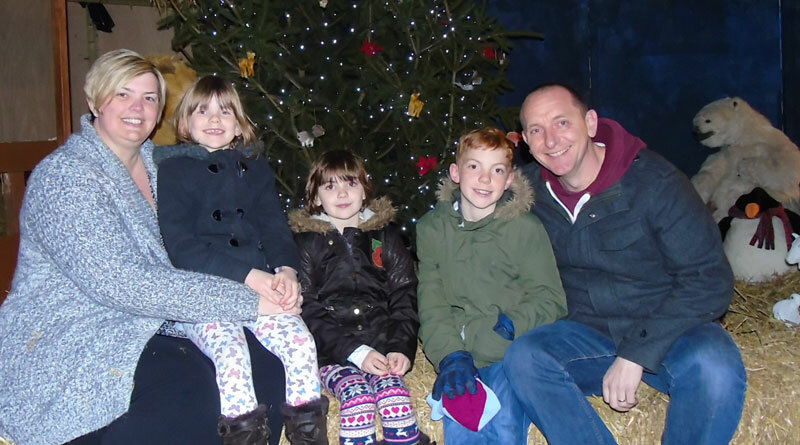 He also announced the winner of the most recent online competition: lucky winner Mandi Gough, of Shrewsbury, took home an annual family pass for Hoo Farm, after successfully spotting the most Christmas songs in the Step Into Christmas mailing. Local children were thrilled to get their first glimpse of Father Christmas as he made a surprise appearance to check on Whisper’s behaviour, and to remind everyone that he would be visiting on Christmas Eve – if he was left a sherry and a mince pie! ​​The Hoo Farm Animal Nativity will be performed daily up to and including Christmas Eve, with special appearances from Father Christmas at the weekends.